10) 4 big carrots—peeled and cut into halves. Mix all the first six ingredients in a big pot. Place on medium high heat for 20-30 min. When it starts to boil, add boiling water to the mixture to cover. Then cover and let cook for 30 minutes. Then add the paprika (or cayenne), Tunisian tawabel and cover and let cook for another 30 min. Add the carrots, cover and cook for another 30 min. When the carrots are cooked through but still maintain their shape, add the zucchini and cook for another 30 min. It is ready. All you need to make now is the couscous. 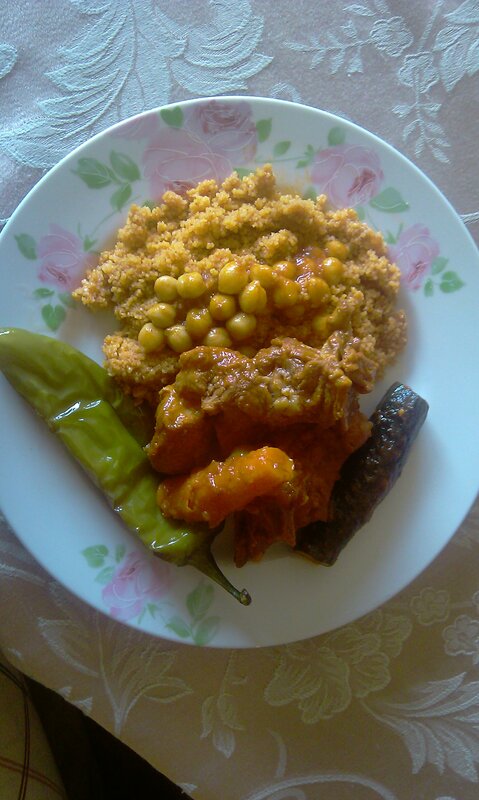 Fatma’s was the easiest and quickest method for making couscous. You will need a couscous pot of course. Fill the bottom pot with water and let boil, once it comes to a rolling boil place the 1 kg of couscous in the top part (that has holes) and attach it to the bottom pot. Cover the top, and let steam for 20 minutes. After twenty minutes, sprinkle about ¼ cup of hot water on the couscous and run a form through it, and let steam again for 15 minutes. To serve, spoon out the meat and vegetable onto a serving platter. Pour just enough sauce onto the couscous to turn it into a nice reddish in color–be careful not to soak it. In another bowl mix some sauce in with the chick peas. Any leftover sauce, place in a serving bowl for those who want to spoon over their couscous. Optional: Fry some Anaheim peppers with salt. Wash, slit the sides, salt, and fry. They are a delicious accompaniment to this dish.